Clean the house – Even though we should all be doing our part to keep the house clean, most of the work is usually done by mom. On Mother’s Day, however, there is no way mom should do anything that involves a broom, mop, vacuum or sponge. That’s where you come in. Tell mom to relax while the family does all the chores: wash the dishes, vacuum the rooms, dust the furniture, fold the clothes, etc. The goal is to make mom’s life a bit easier on her special day. After all, that’s what she does for the family the other days of the year. 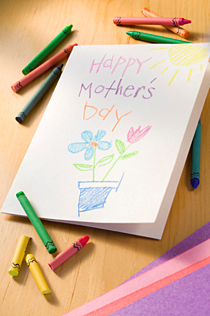 A heartfelt card – What mom wouldn’t want a hand-drawn picture from her kids (or loved ones!)? So, find some clean sheets of paper, break out the crayons and markers, and create a card that makes mom break into a big smile. Write a letter – Mom probably gets lots of text messages and plenty of email, but when was the last time she received a handwritten letter from you? Probably as far back as when stamps were still 15 cents? Since the idea is to make mom feel super special, take time to write her a letter, thank her for her hard work, praise her for her inner and outer beauty, and compliment her wisdom, kindness, generosity, patience and creativity.